GM plans to close multiple plants that focus on the assembly of cars. The company forecasts increasing automotive cash flows by ~$6.0 billion by 2020. GM is set survive any current down cycle in the auto sector and thrive beyond 2020 as TaaS ramps up. 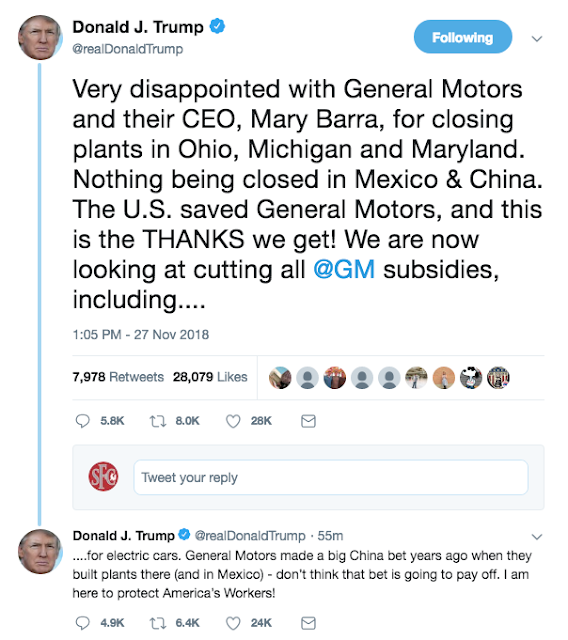 My investment thesis has long held that the General Motors (GM) under the leadership of CEO Mary Bara is not your fathers GM. The auto manufacturer has correctly invested in transportation-as-a-service (TaaS) opportunities to position the company for the future while cutting costs. The stock has lagged due to fears of peaking auto sales, but the transformation should position GM to profit through a down cycle and into the massive TaaS opportunity down the road. Trump has threatened the elimination of subsidies for EVs, but investors should ignore these threats. Trump can't just eliminate subsidies for one auto manufacturer. Disclosure: Long GM. Please review the disclaimer page for more details.